Top and bottom left Photo by Jefferson Wheeler - View gallery at Star Tribune. 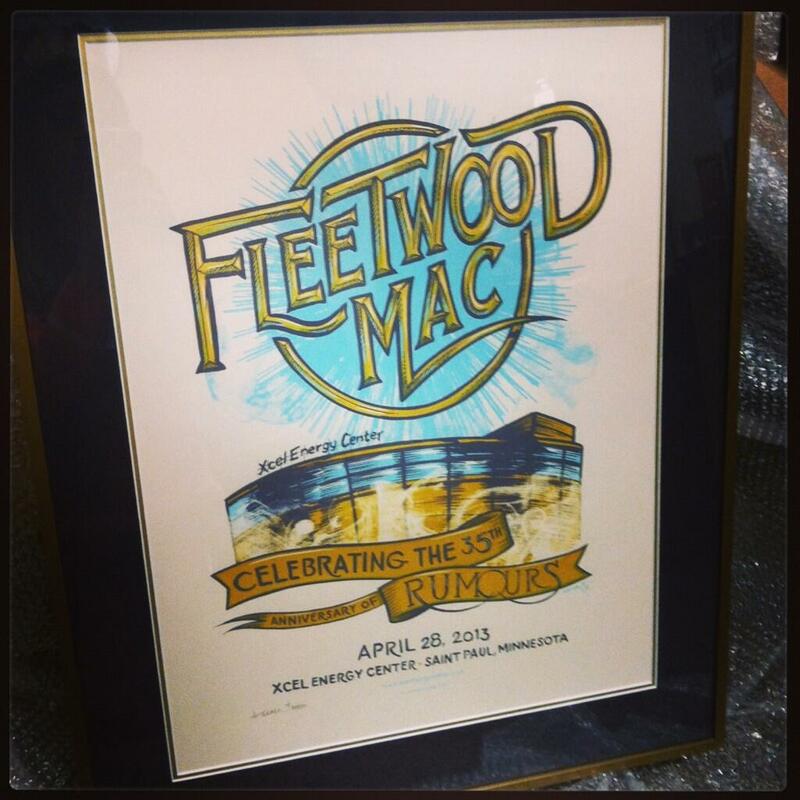 The Fleetwood Mac Poster is an original design by Adam Turman commissioned by Xcel Energy and given to Fleetwood Mac as a gift. 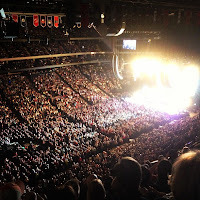 Something felt rather familiar about Fleetwood Mac's Xcel Energy Center show Sunday, April 28, and it wasn't just the band's songs, which remain some of the biggest-selling, most widely known of the rock era. Instead, it was the set list -- the very order in which the group played those songs -- that was secondhand news. 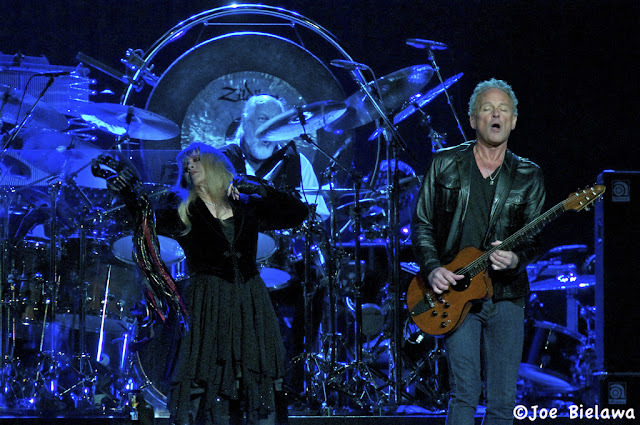 Four-fifths of Fleetwood Mac's most famous lineup last headlined the downtown St. Paul hockey arena in March 2009, and Sunday they performed a whopping 17 of the same songs. Of course, with a band like this, there are hits they're always going to play ("Don't Stop," "Go Your Own Way," "Landslide"). But this wasn't just hearing the same old numbers four years later, but hearing them largely in the same sequence. Just like in '09, "The Chain" led into "Dreams" early in the show and then "Big Love," "Landslide" and "Never Going Back" occupied the same three-song stretch at the midway point. And once again, the sequence of "I'm So Afraid," "Stand Back" and "Go Your Own Way" wrapped things up and opened the door for virtually the same encore, with "Say Goodbye" added to "World Turning," "Don't Stop" and "Silver Springs." So what was different this time around? Well, most notably, Stevie Nicks was much more present and didn't let her energetic frenemy Lindsey Buckingham steal the spotlight quite as much (even though the crowd cheered at nearly everything he did). At 64, her voice has lost much of its power, but she still looks terrific and she seemed to be enjoying herself much more Sunday night than four years back. 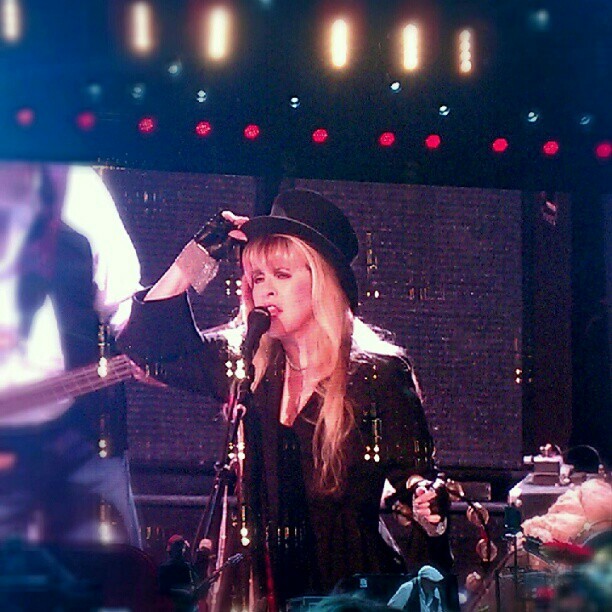 Buckingham reportedly wanted to record a fresh disc for 2013, but Nicks couldn't get her act together in time. 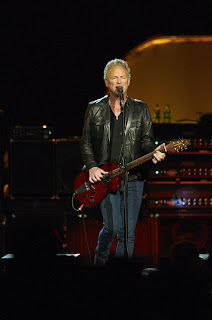 They did manage to work in one brand-new track, the upbeat and poppy "Sad Angel," and one number they dug out from the vaults, "Without You" (an unreleased snoozer from the pair's pre-Mac band Buckingham Nicks). Beyond that, the band kept to the oldies, with the vast majority of the songs originally written and recorded in the mid-to-late '70s. It was a nice surprise to hear "Eyes of the World," a deep cut from 1982's under-appreciated "Mirage" album, although almost any one of the other album cuts from that era would've been a better choice. As always, Christine McVie was missed. She retired in 1998 and while she was always a distant third behind Buckingham and Nicks, her softer, more romantic songs lent the band a certain humanity they've been lacking in the years since. 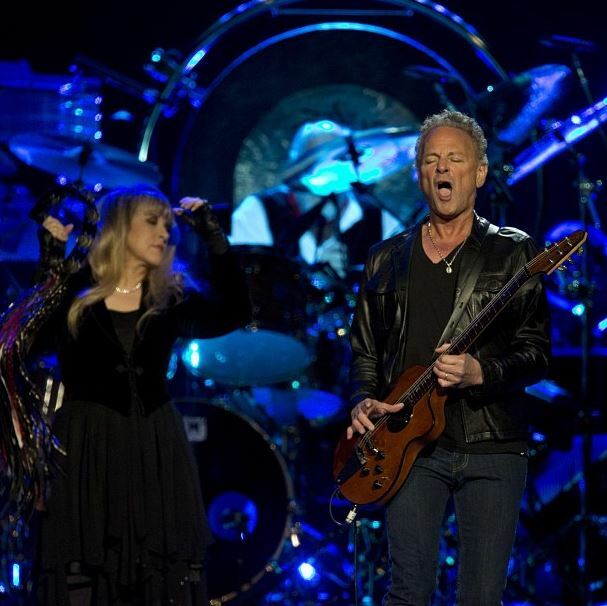 Lindsey Buckingham, not croaky Stevie Nicks, carried Fleetwood Mac Sunday night at the X.
Lindsey Buckingham wore the exact same outfit again. Black leather jacket, black V-neck T-shirt, black boots and, presumably, the same bluejeans. That’s what the rock star sported when he performed a solo concert in November at the Dakota Jazz Club, the most impersonal (and loudest) performance probably ever in that intimate space. On Sunday at the sold-out Xcel Energy Center, he gave one of the most impassioned performances ever in a Twin Cities arena, this side of Bruce Springsteen. Oh, sorry, it wasn’t actually a Lindsey Buckingham show. It was Fleetwood Mac, the band that made him famous. But singer/songwriter/keyboardist Christine McVie retired in 1998 and Stevie Nicks — Buckingham’s former lover whose romance and breakup has been the subject of many of the band’s songs — needed a good half of Sunday’s 2 ½-hour show to warm up her voice. Granted, her voice is lower, harsher and less fluid than before, but her versions of “Rhiannon” and “Sara” were so croaky and lifeless that she couldn’t have placed in the top 5 in a Stevie Nicks sound-alike contest. Nicks, 64, finally found her voice for “Landslide,” a duet with Buckingham, his voice and acoustic guitar. After saying she usually dedicates the song each night to a family member, Nicks said on Sunday, it would be a rare dedication to her “one and only husband,” Minnesotan Kim Anderson, who was in the audience and, of course, is no longer her husband (they divorced after a short marriage; he was the widower of her best friend, who died of leukemia). Nicks’ incurable romanticism has fueled her art and Fleetwood Mac. She got so inspired during “Landslide” on Sunday that at song’s end she and Buckingham blew kisses at one another. Of course, they followed that with a scorching “Never Going Back Again,” during which Buckingham sounded maniacally determined on vocals and guitar and Nicks offered credible vocal harmonies. Although she did only a few slow-motion revolutions of the famous Stevie Nicks dervish dance, she hit her vocal stride, delivering “Gypsy” with conviction while facing drummer Mick Fleetwood (another of her exes). She finally became the bewitching Nicks of yesteryear on “Gold Dust Woman,” investing the song with mystery, passion and her trademarked accouterments of shawls and scarves (the top hat would come later, thank you). With all of the Buckingham/Nicks soap-opera songs, the comforting, buoyant tunes (and sweet vocal harmonies) of McVie were missed. The band did her “Don’t Stop,” with Buckingham and Nicks alternating as lead singer on the verses. But this really was the Lindsey Buckingham Show. Buckingham, 63, tried to provide context with his introductions to songs. For instance, he explained that “Big Love” was written as a “contemplation on alienation” but now he sees it as “a meditation” on change. Indeed, his transformation to de facto frontman of Fleetwood Mac has helped the Rock and Roll Hall of Fame group maintain its magic. 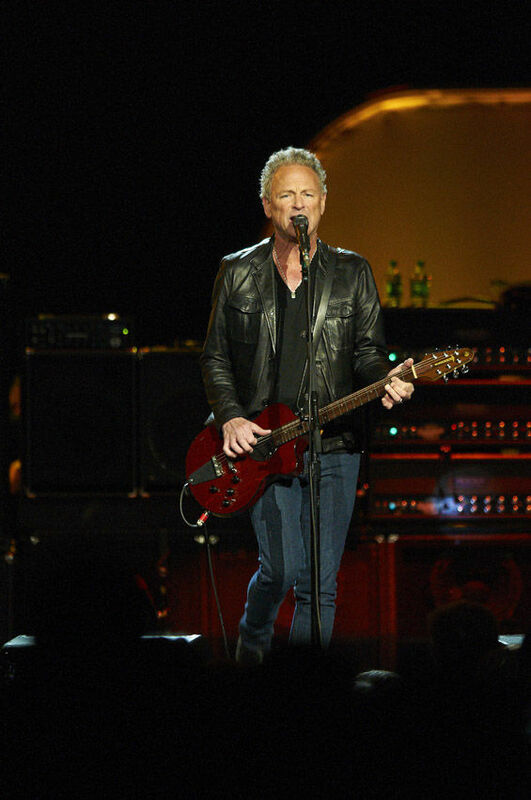 Lindsey Buckingham claims Fleetwood Mac has recorded a bunch of new material. He promises an EP to be released in days. 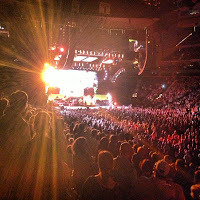 On Sunday at the sold-out X, 16,000 fans heard only one new number – plus one obscure Buckingham Nicks song. Despite its title, “Sad Angel” was peppy rocker, asking the sad angel if she’d “come to right the war.” The vocal harmonies between Buckingham and Stevie Nicks felt different, and the song had almost an Americana vibe, with guitars ringing like Springsteen. As for “Without You,” the Buckingham Nicks rarity was an un-dynamic slice of dated folk-rock with pretty straightforward lyrics. Although Nicks wasn’t in acceptable voice for the first half of the show (as chronicled in my review), she, like Buckingham, was fairly chatty. She was certainly friendlier than at Big Mac’s last St. Paul gig, in 2009. At the end of the evening, after Buckingham and everyone else had left the stage, Nicks told the crowd that “it’s all your fault. We throw the songs out and you catch ‘em with dream catchers and throw them back at us.” OK, discuss amongst yourselves. The surviving Fleetwood Mac quartet was augmented by two female backup singers (including Nicks’ sister Lori Nicks), a guitarist and a keyboardist/guitarist, all of whom were introduced. There also was a second drummer behind Fleetwood’s kit who was anonymous. 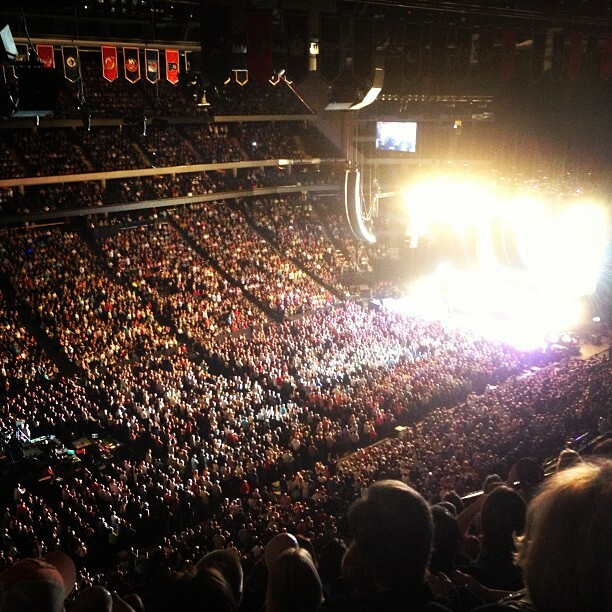 major tour, which came to Xcel Energy Center Sunday night. Since keyboardist and vocalist Christine's McVie's retirement, their shows have become very much the Lindsey Buckingham/Stevie Nicks show, of course backed by the most solid rhythm section of Mick Fleetwood, John McVie, and a few additional musicians. Sticking mostly to their peak period of mid-'70s to mid-'80s, the two alternated between their many hits, relying on their long and storied history of romance and breakup, using that tension to fuel their strong chemistry. The two traded places in the spotlight with Nicks occasionally leaving for wardrobe changes -- mostly variations on her trademark flowing gowns suitable for twirling. Two big exceptions to the predictable "best of" set included a brand new tune, "Sad Angel." The upbeat, almost country-ish acoustic shuffle will be part of a new EP to be released in a few days, according to Buckingham. The second, "Without You," while new to most everyone was actually a very old tune Nicks explained they'd literally forgotten about and only rediscovered when it popped up on YouTube and sparked their interest in reviving it. While their stage set included the now customary multiple jumbo screens and choreographed digital animation, the focus was always on the four bandmates, who occasionally slowed the tempo for the quieter numbers but never seemed to let up on their intensity over the two-and-a-half hour show, much to the delight of the capacity crowd. Songs from each of the band's albums of the Buckingham-Nicks era were featured, but some of the loudest cheers came for the brief acoustic set midway through the show with Buckingham's insanely frenetic solo version of "Big Love", Nicks's "Landslide," and Buckingham's "Never Going Back Again," which was drawn out for a little extra drama. 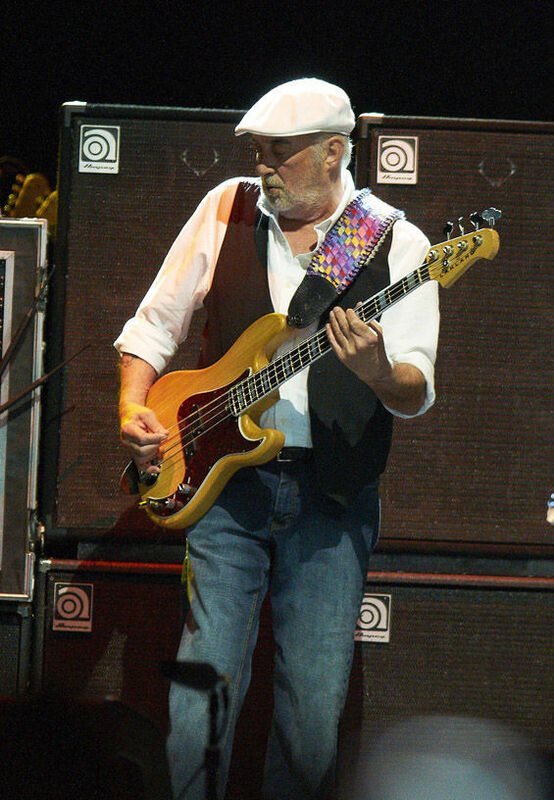 One of rock's most innovative, versatile (and occasionally overlooked) guitarists, his playing was continually and appropriately in the spotlight as was his energetic presence as band leader and all-around driving force, something Fleetwood acknowledged during the band intros at the end of the night. The drama continued with a powerful version of the '75 classic "I'm So Afraid", followed by Nicks's solo hit "Stand Back" and the rousing closer "Go Your Own Way" -- for which Nicks donned her classic top hat. The last encores brought an emotional end to the evening with Nicks's Rumours-era b-side "Silver Springs" and ending with the bitter sweet "Say Goodbye" from the 2003 Say You Will LP, an acoustic song Buckingham wrote about finding closure to his relationship with Nicks and sung as a tender duet directly to each other. 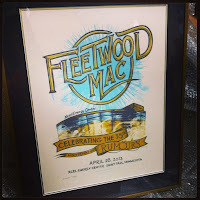 After the last song, both Fleetwood and Nicks came out for a final curtain call and to thank the audience for both a wonderful night and possibly a wonderful career as it's obviously possible that this could be the last visit by the iconic group. I disagree with the review. I don't think Stevie's voice has lost power. She may not be able to hit the high notes like she used to but her voice is no less powerful. I'm just as taken aback by her singing now than I was back in the day. 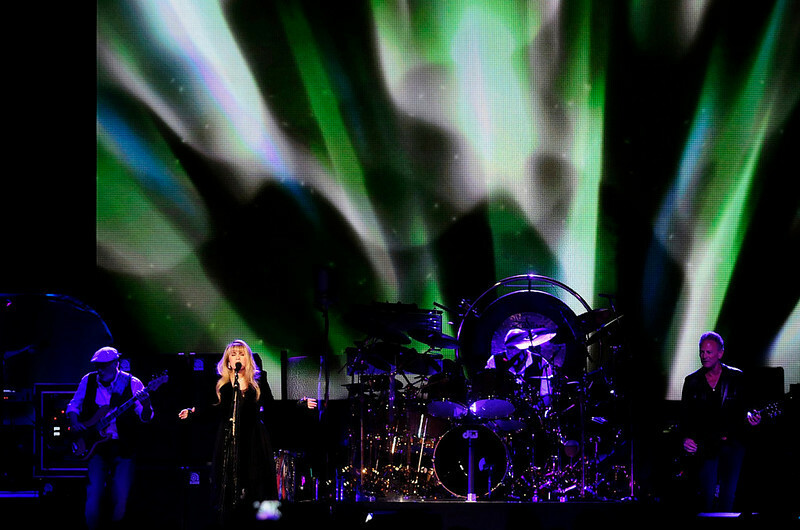 The only good thing about that review was how energetic Stevie Nicks was. She was totally into the music! Her voice had lots of power and while she avoided those really high notes, it didn't take anything away from the performance. I've seen FM over the years and this was one of the best I've seen . . . period! Another Star Tribune/Jon Bream review where he tries to show how important he is and how much more he knows about music than YOU. The Pioneer Press reviewer was a little less condescending but was still negative. I attended the show and loved it. The entire band, including Stevie, was in top form and put on a great show. I liked that both Lindsey and Stevie talked more than in previous shows and really engaged the audience. It was 2 1/2 hours of solid musicianship. Methinks some reviewers have forgotten the reason they became music critics in the first place: because they love the music. 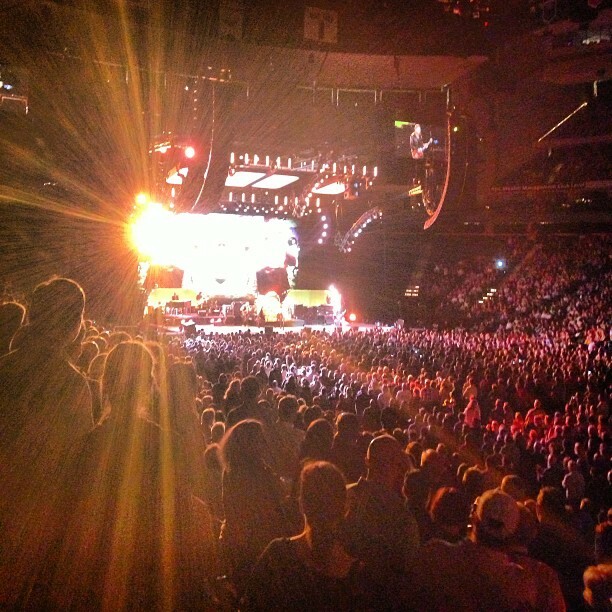 For what it's worth, I don't think Stevie's mike was up high enough the first two songs. But technical difficulties aside, this was an amazing show designed and delivered for those of us who are true, lifelong fans. I was beyond thrilled to hear "Eyes of the World" and "Sisters of the Moon," and Stevie was incredibly warm and connected last night. Worth every penny, even if now I can't afford a babysitter for my kids this summer. The reviewer obviously didn't know that Lori Nicks isn't Stevie's sister. I still don't understand why they always pick on Stevie's voice when Lindsey's voice has changed as well. There are some notes that he can no longer hit and yet they always zero in on Stevie. Flying Monkeys are all so predictable. Why must the review be crapped on just because it doesn't say what you all want to hear? Not everyone out there is willing to plaster over the cracks and pretend this is 1977. This band is old and they're showing it on this tour like never before. Thankfully, some reviewers are willing to say it! Personally, I like LB is a washed-up drone who recycles guitar lines over and over and over, and can no longer sing AT ALL. He hasn't actually sung a note since 1997. It's all moaning and breathing hard and then some shouting. As for Stevie, I think she's still a good singer, but ONLY when she tries to be. She's not doing that on this tour and so we're getting the monotone one note show void of emotion or any real feeling. The result is harsh and cold. Edit ^^^ "I 'THINK' LB is a..."
^ Lighten up on the name calling! Stevie's voice has changed, it has deepened and she can't sustain the high notes so she doesn't try. I respect the Star Trib reviewer's rights to his opinions, but I feel like he came to the show EXPECTING Stevie to sound like she did way back when. Everyone familiar with her newer music knows she sounds different. Does she have some nights where it sounds like she's just not into it? Certainly! But her voice is just as powerful as it once was, it's just lower. Also Lindsey's voice has changed as well ... he is also no longer able to hold a run like he used to. I will agree with the reviewer from the Pioneer Press, however. The show felt the same as the 2009 show to me because of the setlist. The inclusion of "Sisters of the Moon" is fantastic, but I would much rather have them ditch "Rhiannon" and "Gold Dust Woman" and dust off some more Stevie songs like "Seven Wonders," "Storms," and maybe "Sweet Girl." Even if they don't work out, they could try them for a couple shows. Most of us who go to these shows have seen the recent Mac and Stevie tours so I don't think most of us would mind if we didn't hear "Gold Dust Woman" or "Rhiannon." Flying monkeys,that term is getting to be about as predictable as your obvious minority opinion.No one that is credible is saying it is like 1977,but that does not mean they are not any good anymore like you would have everyone believe.For the record most of those kinds of reviews get crapped on for the same reason this "flying monkey" is attacking you for your predictable views(after having read many of you prior posts and this one). We get it you don't think the band is up to it any more, or you seem to enjoy criticizing the choices they are making and think you could do a better job advising them etc.!! !As I have said before several thousand fans every night that they play to seem to disagree with your (minority)opinion.Now I know this won't deter you from you still holding your opinions, nor should it.However, I am also sure your opinions won't deter the majority of us that decide to see them from enjoying ourselves, and having our opinions.Even if you try real hard by calling us all"flying monkeys" etc., after all that is really just your opinion and I sure as h*** won't let it deter me!!! you critical people expect too much. Wish her well every night....send her your love not your criticism.